I meant to take a photo of the whole thing flat before I seamed the ends together, but I was so excited about finishing that I just launched right into the seaming. 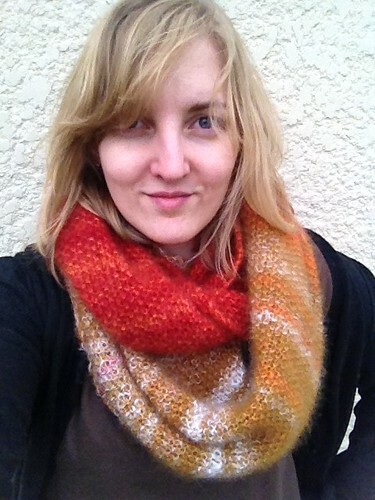 I was about halfway done when I remembered, so… The photo above was taken just after I had finished knitting August. 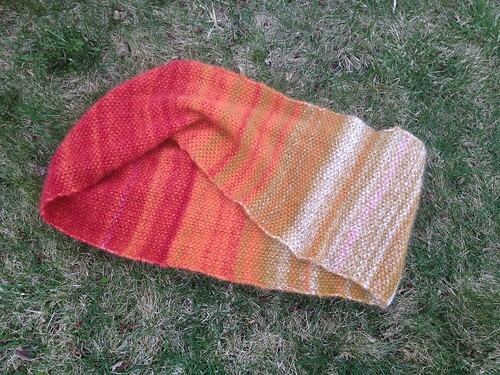 There is a sample of Gradient knit up at my LYS (“local yarn store”) and I had admired it for a very long time. When Jenni invited me to this project (a group on Facebook), I knew this was finally the time to try it out. I had also been thinking I needed to knit something red to wear during Prairie Fire Lady Choir shows, so that inspired my color palette. It’s a very simple seed stitch, but the three strands of mohair held together throughout are what make the gradient work so well. 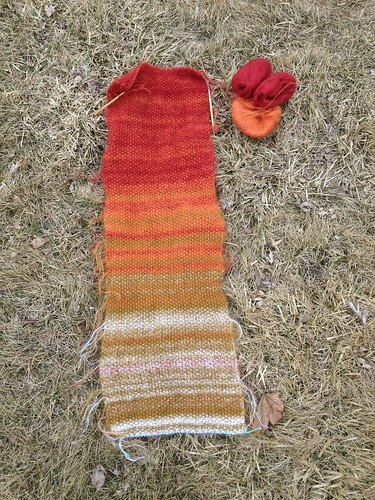 Of course the colors don’t change nearly as often as I had to change colors, so I also had a billion ends to weave in. I just carried the ends across the edges for an additional bit of gradient play (and also because I’m lazy). I’m pretty sick of mohair for the the moment, but I’m happy with this finished item. 2014 was an emotional year, but I marked the day I got engaged as well as the day I got married in this scarf — to remember the best parts of that crazy year. 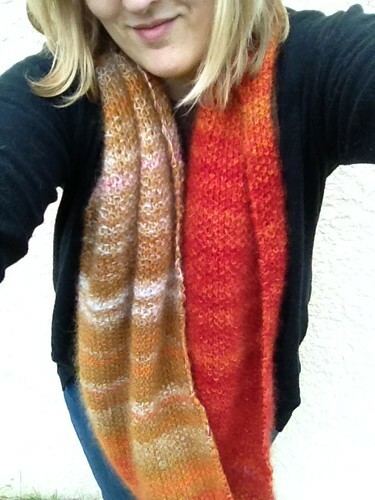 It will be a cozy, comforting cowl to wear in the fall and on “warmer” winter days. It’s super squishy-soft but also feels kind of fancy.